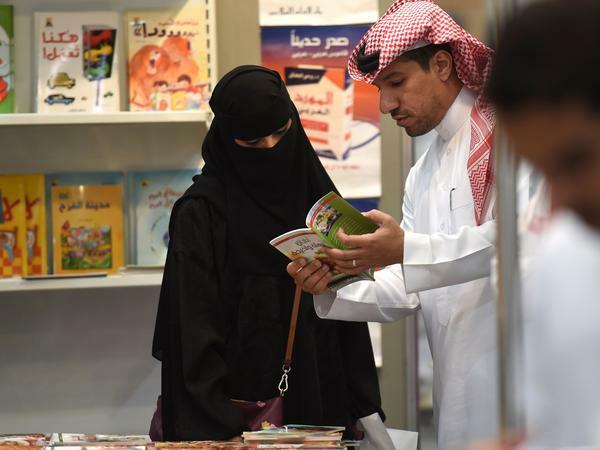 Saudi men and women browse the annual Riyadh International Book Exhibition in 2016. Just a few weeks before the ban was lifted on what was officially known as "Driving Day," June 24, Saudi security officials jailed more than a dozen women activists, some of whom have advocated for the right to drive since the 1990s. In what appeared to be a government-sponsored, front-page smear campaign, Saudi newspapers published the women's names, claiming they were "traitors." "It's horrifying and it's very scary, what is happening right now," Damanhoori says about the sweeping arrests of activists on unspecific charges. "We still don't know why, why now, we still don't have clear answers." For Damanhoori, the driving reform — something backed by Crown Prince Mohammed bin Salman, hailed as a progressive reformer by many supporters — signaled that women drivers and women workers might be part of the kingdom's plan to modernize and diversify the oil-dependent economy. But it only went so far: Saudi Arabia's sweeping guardianship rules remain in place. Every Saudi woman is required to have a male guardian — a husband, uncle, son — who makes major life decisions on her behalf, even if she's an adult. Damanhoori has been speaking out against the guardianship laws from San Francisco. "Women cannot study, cannot work, cannot even travel without male permission or a male guardian; it's as simple as that," she says. When she won a Saudi government scholarship for a graduate program at Notre Dame de Namur University in California, her father had to approve her enrollment and her application for a passport. He had to give his consent for her to travel to the U.S. Under Saudi law, called mahram in Arabic, Damanhoori had to have a male relative accompany her to the U.S.
She says her father accompanied her to California to enroll in her courses and gave permission for her to stay on without a mahram, but when he got back to Saudi Arabia, she says, he changed his mind. "'Who is your mahram?' 'My father,' I said. 'Where is he?' 'Home.' 'Hmmm. Well, Samah, you father called us and asked us to cancel your scholarship because he no longer approves you studying here without a male companion. Is there a conflict between the two of you?' 'Not at all. I don't know why he canceled it since he's the one who brought me here and signed I could be here without a mahram.' "
The Saudi embassy did not respond to an NPR request for comment. Damanhoori decided to stay in the U.S. and cut family ties. "It was really hard at the beginning, I lost myself, I lost the ability to form a whole sentence," she says, describing those first months after she decided to stay in California against her father's orders. "I came from a very strict country to a very free country." Her father Sameer Damanhoori, reached by phone in Saudi Arabia, confirmed to NPR that he had canceled his daughter's scholarship. "That is our custom," he said, referring to the rights that he has under the guardianship laws. He wants his daughter to come home and forget her education. Damanhoori's graduate adviser supported her decision to stay in the U.S. and the college helped her find sponsors to pay for tuition and housing. After graduation in 2017, she got a job in high tech. She has also applied for political asylum in the U.S. Her asylum claim is that the guardianship system puts her in danger. "My story with my father, and — what would happen if I go back to Saudi," she says, is the official narrative she submitted to U.S. officials. She claims her father has been abusive. He denies abusing his daughter, but says if she returns to Saudi Arabia, he will never give permission for her to leave again. Damanhoori now sees her role as an outside voice for Saudi women's rights. She gives talks in the Bay Area, uploaded to YouTube to reach an audience back home. She's regained her voice, she says. "The more I spoke up — the more I went in public, all the noises in my head just became lower," she says. "It's really important to speak loud for these women who are being abused, to never give up." Women's March Global, a New York City-based international organization that helps amplify women's voices, is helping Damanhoori get her message out. The organization has collected more than 200,000 signatures to support the jailed activists in Saudi Arabia and has delivered the petition to the United Nations. "It's important to understand what's she given up to step into this role," says executive director Lara Stein. "But she understands that she's one of the few people that is able to have a voice, and I think at the end of the day, it's a very courageous move." Damanhoori recognizes the message of the activists' arrests. New reforms in the kingdom don't include political openings. Critical voices have been silenced. There is still, she says, a long road ahead for women in Saudi Arabia.